therefore should be vigorously pursued. Some of the critics have stated that Sowell obviously has never heard of thorium reactors. Quite the contrary, I am familiar with the process and have serious reservations about the numerous problems with thorium MSR. It is interesting, though, that nuclear advocates must bring up the MSR process. If the uranium fission process was any good at all, there would be no need for research and development of any other type of process, such as MSR and fusion. Indeed, as already pointed out in TANP, uranium fission plants have barely captured 11 percent of world-wide electricity production after 50 years of heroic efforts. One would expect, if nuclear power were as great as the advocates claim, that nuclear plants would already supply 80 or 90 percent of all electric power in the world. Clearly, they do not because they are not at all great, they have enormous and insurmountable drawbacks in cost, safety, and toxic product legacy left for future generations. Once the thorium MSR process is discussed in this article, the next article will discuss yet a third hope for the nuclear advocates, in case fusion fizzles out and MSR melts away to nothingness. 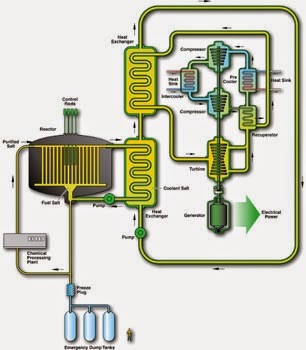 That next article will be on high-temperature gas reactors, the HTGR. As will be seen, HTGR also has serious drawbacks. One final preliminary point: some of the nuclear advocates that push MSR lament the fact that, many years ago, thorium MSR lost in a competition with uranium PWR to provide propulsion for ships and submarines for the US Navy. They say, wrongly, that Admiral Rickover chose uranium PWR over thorium MSR so that the US could develop atomic bombs. What is much more likely the reason uranium PWR won is that the materials used for the MSR developed the severe cracking described below. No Admiral in charge of submarines could take a chance on the reactor splitting apart from the shock of depth charges. The Truth About Nuclear Power emphasizes the economic and safety aspects by showing that (one) modern nuclear power plants are uneconomic to operate compared to natural gas and wind energy, (two) they produce preposterous pricing if they are the sole power source for a grid, (three) they cost far too much to construct, (four) use far more water for cooling, 4 times as much, than better alternatives, (five) nuclear fuel makes them difficult to shut down and requires very costly safeguards, (six) they are built to huge scale of 1,000 to 1,600 MWe or greater to attempt to reduce costs via economy of scale, (seven) an all-nuclear grid will lose customers to self-generation, (eight) smaller and modular nuclear plants have no benefits due to reverse economy of scale, (nine) large-scale plants have very long construction schedules even without lawsuits that delay construction, (ten) nuclear plants do not reach 50 or 60 years life because they require costly upgrades after 20 to 30 years that do not always perform as designed, (eleven) France has 85 percent of its electricity produced via nuclear power but it is subsidized, is still almost twice as expensive as prices in the US, and is only viable due to exporting power at night rather than throttling back the plants during low demand, (twelve) nuclear plants cannot provide cheap power on small islands, (thirteen) US nuclear plants are heavily subsidized but still cannot compete, (fourteen), projects are cancelled due to unfavorable economics, reactor vendors are desperate for sales, nuclear advocates tout low operating costs and ignore capital costs, nuclear utilities never ask for a rate decrease when building a new nuclear plant, and high nuclear costs are buried in a large customer base, (fifteen) safety regulations are routinely relaxed to allow the plants to continue operating without spending the funds to bring them into compliance, (sixteen) many, many near-misses occur each year in nuclear power, approximately one every 3 weeks, (seventeen) safety issues with short term, and long-term, storage of spent fuel, (eighteen) safety hazards of spent fuel reprocessing, (nineteen) health effects on people and other living things, (twenty) nuclear disaster at Chernobyl, (twenty-one) nuclear meltdown at Three Mile Island, (twenty-two) nuclear meltdowns at Fukushima, (twenty-three) near-disaster at San Onofre, (twenty-four) the looming disaster at St. Lucie, (twenty-five) the inherently unsafe characteristics of nuclear power plants required government shielding from liability, or subsidy, for the costs of a nuclear accident via the Price-Anderson Act, and (twenty-six) the serious public impacts of large-scale population evacuation and relocation after a major incident, or "extraordinary nuclear occurrence" in the language used by the Price-Anderson Act. Additional articles will include (twenty-seven) the future of nuclear fusion, (twenty-eight) future of thorium reactors, (twenty-nine) future of high-temperature gas nuclear reactors, and (thirty), a concluding chapter with a world-wide economic analysis of nuclear reactors and why countries build them. Links to each article in TANP series are included at the end of this article. Additional articles will be linked as they are published. Thank you so much for detailing the shortcomings of LFTRs. I've heard nothing but the supposed advantages of this process for years, and always suspected it was too good to be true. Sadly, it seems the atom is not the solution the world needs. Thanks again for this excellent series. Very informative article. Thank you so much. . Suggest you get Twitter and Facebook links?